Yesterday was one of those “eat everything we have in the fridge before leaving for the weekend” days. In the fridge: Half a cup of leftover steamed broccoli from our produce box. Also, fixings for salad, but I wasn’t in a salad mood. 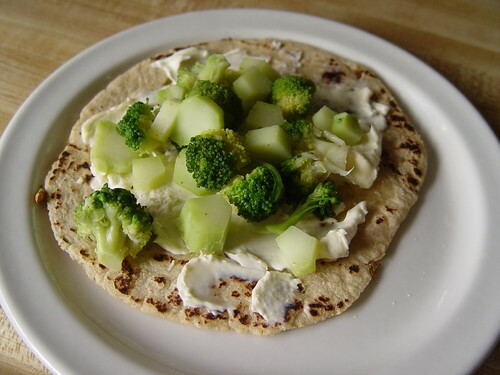 I scrounged a soft corn tortilla leftover from our Tuesday church small group potluck, spread some cream cheese on top, warmed it in the toaster oven, and dumped the rest of the broccoli on top. I suppose it’s sort of like a veggie wrap, but the tortilla was too small to wrap up so I ate it more like a taco! I’m embarrassed to admit that I’m ridiculously proud of myself when I think up ways to combine leftovers. I give myself extra mental points when it’s an easy, uncomplicated solution as well. I think that is something to be proud of because I never know what to do with those annoying leftovers. But I think I would get tired of broccoli soon! Love this idea. I often throw left over vegetables in a sarnie (latest concoction a cauliflower and swiss chees roll)I am glad I am not the only one who does that… I might have to try the taco idea looks yum!